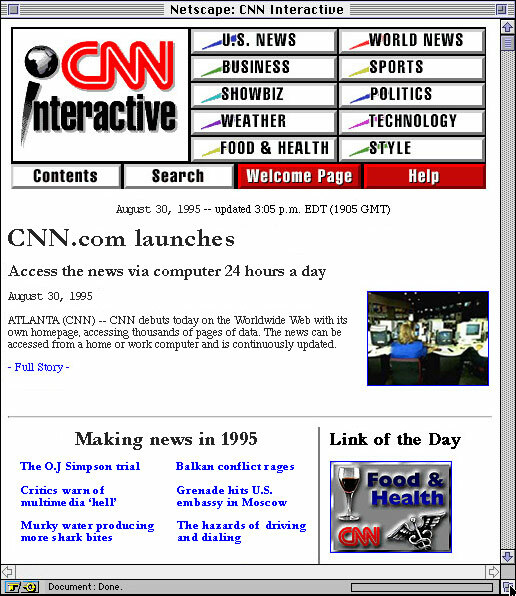 On August 30, 1995, CNN Digital was born. A website was delivered to you, the audience, and has since grown into mobile, apps, social and more platforms. To celebrate the website’s 20th birthday, explore this retro homepage, inspired by the 1995 design (yes, bad fonts, Netscape navigator frame and all). 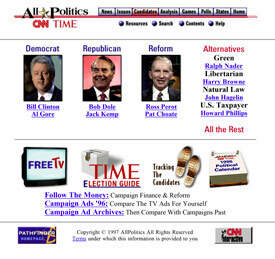 We’ve added 20 bits of trivia, surprises and Easter eggs about CNN and the ‘90s: Some are obvious (think story links); some are a little off the beaten click-path. Can't find them all? Here's the complete list. 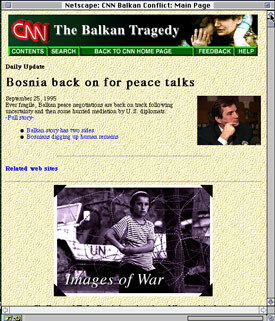 Shortly after CNN.com’s launch, CNNfn was launched to cover business news. The site morphed over the years and now lives on as CNNMoney. A few days after launch, Hurricane Felix hit the East Coast. Almost from the beginning, the web has offered guidance — and misinformation — on health matters. See some of the early debate on cyberspace’s role in health: On-Line Medicine: Cures in our computers? Flashback to 1995’s budget battle, when Congress debated the budget, Republicans and Democrats negotiated and the public tried to make sense of it all. Video has always been core to the site. See what one of the first video archives looked like. Before we launched on the web, we were distributed on CD-ROM via mail. While we kept the name CNN Interactive when we launched on the web, we eventually dropped it in favor of simply "CNN.com." Now, we go by CNN Digital to better encompass the various places you'll find us on the Internet through sites, apps and devices. We actually have two primary versions of our flagship site: one focused for our U.S. audience, and another international version tailored to a more global audience. Our U.S. version is produced and edited at CNN's world headquarters in Atlanta 24 hours daily. Our international edition (we sometimes call it "edition") is edited by staffers in London, Hong Kong and Atlanta. Of course, both versions are supported by staff around the globe. We officially went live on the internet on August 30, 1995. We do! In addition to a Spanish site, we also now deliver the news in Arabic and a host of other languages, in addition to our International edition of the site. We’ve always loved hearing from our audience — thoughtful opinions and your own stories. But sometimes, especially in the early years, the messages were, well, odd. To honor our first year online, the staff rounded up some of the most interesting feedback. Part of being a good web citizen from the start was linking to other sites. Hampster Dance – one of the earliest Internet memes. It consists of animated hamsters. Dancing. A few months before we launched, Netscape 1.1 was launched and was the most popular browser on the web at the time. A look at how CNN's homepage has evolved through the years. ... according to the 1996 CNN.com. At the site’s 1-year mark, the staff reflects on how it all began.